Pannell Discussions » 286 – Marine reserves and tourism benefits » Ideas in economics, environment, policy and more. Coral Bay and nearby Exmouth are economically dependent on tourism. Without the systems in place to protect the reef, there would still be tourism, but surely not as much. This is one of the arguments in favour of establishing and enforcing marine protected areas, in addition to the benefits for fishers that I discussed last week. But how significant are the tourism-related benefits that result from a marine protected area? We set out to try to answer that question for a particular case study: the shark sanctuary in Palau. Palau is a small island state in the western Pacific, about 600 km east of the Philippines. It has several hundred islands, and 21,000 people. In 2009 it declared a ban on all fishing for sharks in its Exclusive Economic Zone – the world’s first shark sanctuary. Since then, shark-related tourism has boomed. 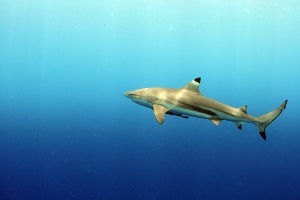 There are many operators offering rides out to areas where reef sharks hang out. People go diving with these sharks, for a shot of adrenaline and bragging rights, I guess. The idea doesn’t appeal to me, but there are enough thrill seekers out there to keep lots of Palauans employed on the dive boats. In addition, the tourists spend money in the other usual ways that tourists do: on hotels, meals, t-shirts, trinkets, and other tourist activities. Not all tourists who go to Palau are there specifically because of the sharks, of course, but plenty are. In our study, we focused on those tourists who said that they would not have gone there but for the shark-diving opportunities. We surveyed a sample of tourists about their reasons for visiting Palau, their activities and their spending. Well, I didn’t personally, unfortunately. It was lead author Gabe Vianna who got to go there. He also surveyed tourism operators for more information about tourist spending on different types of trips. And we used government statistics to estimate the total number of tourists, and inferred the total number of tourists coming specifically for sharks, based on our tourist survey. Economists measure economic benefits in a variety of ways. In this study, our approach was quite simple. We estimated the revenues obtained by businesses directly benefiting from the presence of shark divers (dive and tour operators, hotels, restaurants and souvenir shops). The calculation of the economic benefits from shark diving to the local community were restricted to wages provided by the dive operators to their employees and the revenues obtained by the fishers from selling their catches to shark divers. This approach doesn’t capture all the benefits, and it ignores the costs of providing goods and services, but it’s a useful indicator. The results were really interesting. We found that shark diving is a major contributor to the economy of Palau, generating US$18 million per year and accounting for approximately 8% of the gross domestic product of the country. Annually, shark diving was responsible for payment of US$1.2 million in salaries to the local community, and generated US$1.5 million in taxes to the government. Fishers earn more selling fish for consumption by shark divers than they would gain by catching sharks. The revenue generated by shark tourism is thousands of times greater than the revenue that would be generated by shark fishing. Palau is just one example, of course, but it’s not the only country doing this sort of thing. Indeed, there is something of a boom in the declaration of marine protected areas by small island states, and other countries. Check out the map below (click on it to see a bigger version). 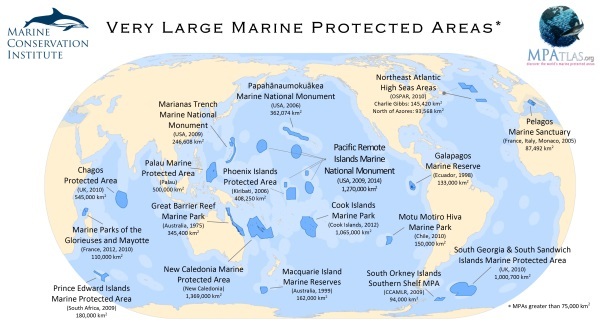 These countries are judging that marine protected areas make good sense, not just ecologically, but economically. Posted on 9 November, 2015 by David Pannell. This entry was posted in Economics, Environment, Marine.